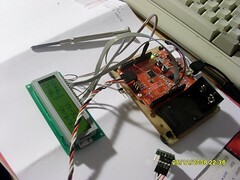 A simply digital spirit level using a LIS302DL accelerometer from nkcelectronics coupled with a seeeduino for processing and a 2x16 character LCD display for output. Sketch is available for your convenience. Note the Sketch includes an extra feature: PWM backlight on pin3.